Where is my credit card stored? SkyCiv uses third party merchants PayPal and Stripe to take payments. These merchants are large companies whose entire business revolve around taking payments and ensuring credit card information remains safe. This is what they do best. SkyCiv will never store your credit card information, but rather passes this information directly (through the same SSL encryption that banks use) to the merchant. SkyCiv stores our users’ files on our secure servers, that can only be accessed by the user and SkyCiv Developers. SkyCiv also has systems in place to protect your information from being accessed by anyone who is not logged in under your account. SkyCiv also runs automatic backups of our server to ensure your files are kept safe. So if you ever accidentally delete or lose your files, please email us at [email protected] and we can recover them for you! Learn more about our Record Keeping. Engineers often need to roll back old files or may need to get access to a file that they have lost. SkyCiv has processes in place to ensure you don’t lose any of your hard-earned work or can resort to old files if you ever need to. How can I get access to an old file or previous version? 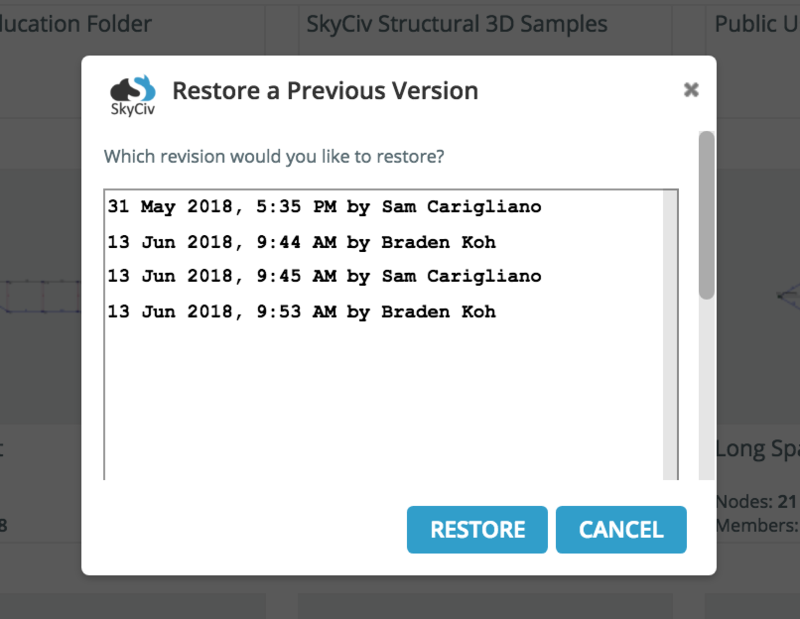 SkyCiv records all the revisions of your files, so as you build your structure you can roll back a previous version. This also means you only need one file, and don’t need to make constant copies and changes to filenames, e.g. Project v1 or Project v2 final. You project is stored as one clean file, yet contains all previous revisions for you to access at anytime. You can also track who made the changes to your file if you have it shared with other members of your team. It's easy to roll back a previous version, simply open the file and visit File -> Manage Previous Versions which will open up a popup, allowing you to roll back saved versions. The version you are currently on will still remain. SkyCiv stores our users’ files on our secure servers, hidden away from public access. These files are backed up every day in the event any information is lost, corrupted or if you accidentally delete a file you need. Simply email us and we can locate and restore your file for you. How else can I keep records for future reference? We understand it is important for engineers to keep documentation and storage of previous projects. SkyCiv will not delete your files - even if you have cancelled your subscription. You can also export the entire contents of your model File -> Export -> JSON and store them locally, so you always have your files when and where you need them. Reporting is also a great way to store the model setup and results of your projects. Having a hard or soft pdf copy is a great way to archive some of the structures you have built in the event you ever need to look back at the analysis. These reports have timestamps, designer names, software version, model setup and results clearly defined so everything is well recorded.